Last week I almost died. Or at least was pretty darn close to a hospital visit wearing one of those gowns with built-in air conditioning. Kim, Jenna (the Chief Sales Servant), and I were on our way to Milwaukee for a National Speaker’s Association meeting. The conversation was light and lively. Christmas music was on the radio. As we approached a flock of cars, I tapped on the brake to slow down, and made a very alarming discovery. The cruise control would not turn off. Kim and Jenna did not comprehend the gravity of the situation at first. 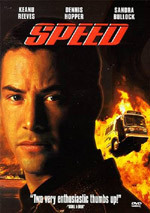 Meanwhile, thoughts of Keanu Reeves emerged in my mind, and I was jealous that he only had to keep the bus at 55 miles per hour while my ride was stuck on 70. Unsure of what to do — all the good ideas don’t seem to surface until a few hours later — we decided to get off the highway. I found the first ramp, took it, and applied the brakes hard. That managed to slow us down to about 15 mph. While happy to be going at a slower, more manageable speed, I noticed a car ahead of us on the ramp. Stopped. Ah, stopping. What a wonderful concept. Now we’re in trouble, I thought. In a moment that seemed like a speedy blur and slow motion all at once, instincts — or more likely angels — took over. I swerved around the parked car and into oncoming traffic. The traffic swerved around me, hurling rude insults with their horns — yeah, this is how I normally drive! — and we served onto another road. Lots of swerving. I was able to put the car into neutral and turn off the key as we settled in front of a gas station. Amazingly, we didn’t hit a thing. Once we got our bearings, we summoned a local mechanic, who transported the three of us in the front seat of his tow truck. The culprit ended up being a shop rag, which somehow got left behind after an airfilterectomy. It had jammed in the engine, causing the accelerator to stick. All told, the whole experience cost us $83, which our embarrassed local mechanic sheepishly ate. But I know it could’ve been much worse. Many years ago when I was in junior college I rode my bike down the route 251 hill by the Peru bridge near Maze Lumber. I was going way too fast. I needed to break and I flipped over the front of the bike and landed on my back. It could have been much worse. I could have been badly injured or even killed. Over the years I have thought about this incident many times. Here’s my point: I figured that the good Lord had a life purpose for me, that maybe I was to grow up and become a father for you and your brothers. No Walt, no boys. Your work rag in the engine of your car really interests me. First God “puts” that work rag in your engine and you all could have been killed. But you weren’t. And he wanted you to remember how big HE is and how little you are. He’s calling the shots. So he spares you guys for a reason: I really believe he has a purpose for you guys and you’re on His mission. His thoughts really made me think. One of my favorite Bible verses is “‘For I know the plans I have for you,’ says the Lord. ‘Plans to prosper you and not harm you, plans to give you hope and a future. '” (Jeremiah 29:11) Kim and I had that verse read during our wedding. It has kept me going through the lean times. I feel fortunate that things ended up as they did. And as we get set to close out 2006, a year of ups and downs, this incident helps put things in perspective. I’m looking forward to being with my family for Christmas. And I am excited to think about what God does have in store for us. I’m more than happy to let Him do the driving. I’m glad you’re OK! What a frightening experience! But your faith continues to serve you well. Enjoy Christmas “extra much” with your family this year. Glad to hear everything turned out fine. I remember when your dad had that incident. It is amazing how we are looked after by God. I truly believe he has a special plan for all of us. Merry Christmas, Jason. I hope your family Christmas is relaxing!! Praise God that you all are ok!!! I remember Jenna sharing a story about a car accident around Christmas time and a bible verse in a Christmas card….God surely takes care of all of us! I’m not much for mainstream music, but Carrie Underwood’s got it right when she sings “Jesus take the wheel”….the song ironically about a girl in a car accident. Be safe and have a very Merry Christmas! My old (as in long ago, not as in decrepit) was involved in a very bad truck accident and was taken to the emergency room where they removed glass from her back. Later the nurses told her that while she was under anesthesia, she was talking and had said “the room is full of angels”. Not that that has much relation to your story except that it’s nice to know our guardian angels are there and that sometimes we can even see them! Wow. Cool story, thanks for sharing. Thank God for guardian angels, huh?